Visiting Camargue was a childhood dream and this much-needed week off surpassed all expectations. Friends, colleagues and clients know I enjoy unspoiled nature, animals, tranquility and photography and Camargue offers all of the above on a silver platter. Perfect weather throughout, over 350 images taken and the icing on the cake that made this holiday incredible was where we stayed. Marie and Michel Durand-Roger deserve this plug. They have created a peaceful, elegant, welcoming and surprise-filled haven on a 74-acre family property where nature is king. I could tell you about this place’s history and all its unique attributes, ranging from Roman baths to a life-size chess board, but Michel takes such joy sharing his knowledge and passion, I’d rather let him regale you if you visit. We stayed at the Château la Pompe, also known as the Domaine de la Banquière, where Léo, one of the four peacocks who live on the property, reigns proudly. What an extraordinary privilege to become fast friends with such a beautiful animal! He’d come along as I’d walk the dog over to see the horses, ate out of my hand (he prefers madeleines to almost anything else) and by the end of our stay, would come when called and let me stroke his head and fanned out tail. A week is just barely enough! We spent a morning and evening at the Parc Ornithologique (they’ll let you stay all night if you can deal with the mosquitoes after dusk! ), explored Aigues Mortes, took a long walk on the beach from Saintes Maries de la Mer to Beauduc, hit the famous Saturday market in Arles, enjoyed a two-hour boat ride on the Pescalune, and I treated myself to a half-day horseback ride through the marshes and on the beach on a very gentle 15 year old mount named Gaspar at the Cabanes de Cacharel – real pros who care for their horses and don’t just use them to the core to make a buck during the tourist season. It’s going to be tough getting back to work after such a complete change of pace and scenery! 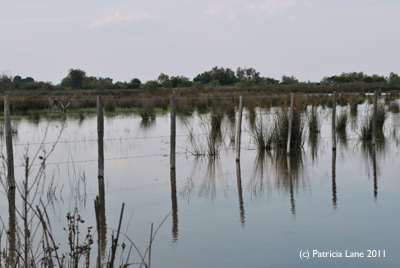 The projects scheduled for the next month or so are good motivations, and so is the intent to return to Camargue as soon as (reasonably) possible. Patricia, I hadn’t seen this post and it’s lifted up an otherwise pretty bland and frustrating evening. 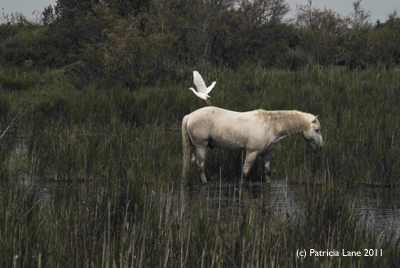 Believe it or not, I was brought up very close to the Camargue (near the roman city of Orange). It was a usual Sunday outing for us and sadly, as a child, I never really paid it much attention, apart from the flamingos, the wild horses and the bulls. I have since gone back a few times and fallen totally in love with the place even though it is already so familiar. One of my fondest memories is of taking my ex-husband there when we first met. He is a keen bird-watcher, so you can just imagine! We were driving along this long lonely road leading to the Plage Napoléon at Port-Saint-Louis and stopped to go and have a closer look at what appeared to be a long row of big old stones from a distance. As we were walking closer, a huge flock of herons (the stones) took off. It was a fabulous site. 10 years later, I went with my current partner in the middle of the flamingo season. There were masses of pink everywhere in searing heat (picture the heat haze and the pink colour) and it was just stupendous. Your pictures are fabulous and really capture the spirit of the place. The culture of the place is also totally fascinating, with the huge traveller influence, the bull-fighting, the fabulous costumes, the “guardians” with their wild horses and leather crafts, etc. Not always for the faint-hearted but nonetheless incredibly interesting. You’ve made me feel very nostalgic! Goodness, I asked a zillion people for advice and suggestions before planning the trip and got just a few pointers. And without knowing it, I had a local gal’ right under my nose :). I plan to go back, so your pointers will be valuable. There was one heron who hung out on the “domaine” where we stayed. His thing was to wait for the gates to open and hop along in front of the car as it went down the unpaved road, making it go even more slowly so as not to hit him. He seemed to have such a good time with that! We also met up with a family of “gardians”, the young son – about 14 – was learning the ropes and was oh so serious about it all (and himself). His horse was the gentlest one I’ve met, he kept resting his forehead on mine…Hated to leave! If you miss flamingos, I should send you some images, I have several dozen good ones. They are beautiful, but they sure have “attitude” and a poor teaming skills. I’m just over the moon with horses everywhere (always wanted one, though I am too intermittent a rider to be any good – scared myself silly this time!) 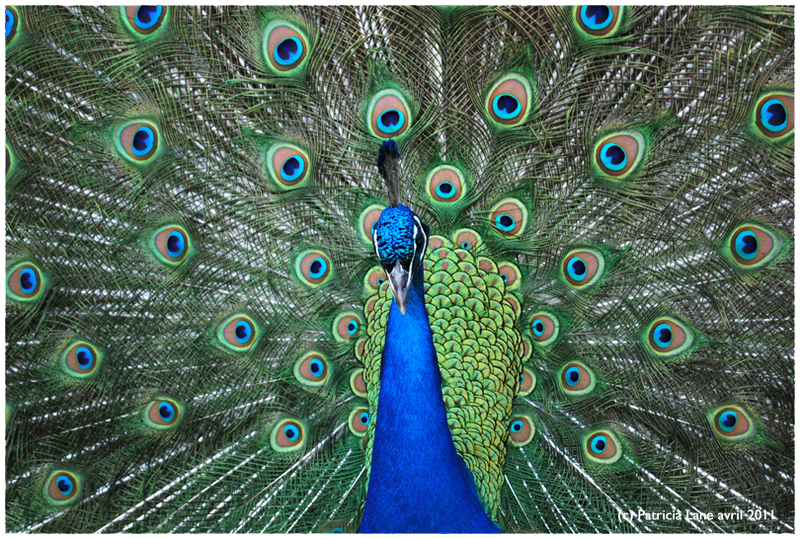 and especially with Léo the Peacock who just charmed the dickens out of me. The beach and wide open spaces – I hadn’t enjoyed something as “free” since I lived in Hawai’i. With the nose to the grindstone, this short break seems so far away already. Sigh! I’ll get my mum on the case if you need further pointers. She’ll be much better than me. Your holiday sounds idyllic. Trust me to misspell “gardian” considering the number of school projects I had to do about them! I can see why you want to go back but go and look at Provence too, it’s sure to blow your mind. It’s where 90% of my heart belongs. I’m not a horse person but wild horses have a definite appeal. I had a fantastic away-from-it-all break on Dartmoor last year and felt totally rejuvenated after all the long walks in wide open spaces and random encounters with wild ponies. Would love a flamingo picture as wallpaper since you’re offering! Next short break for me will be Scotland again, near Skye, a fabulous little place called Plockton. Watch out for pictures of wildlife (dolphins, seals and otters mainly) but I don’t have half of your talent for photography.